Copyright, 1887, by H. W. Hitchcock. And calls to mind the one who passed away! What tender mem'ries gather as o'er the page I bow. Of one whose smile was fairer far than day! When twilight softly falling has lulled the hours to rest. It brings to me a message so loving, sweet and blest. The letter that was written long ago! That dear old faded letter, this fondly treasured letter! How loved and cherished none on earth can know! A little withered blossom between the leaves I see. O dream of love that faded in its bloom! The fondest one is this amid my gloom! Oh, better than all treasures that life can give to me. 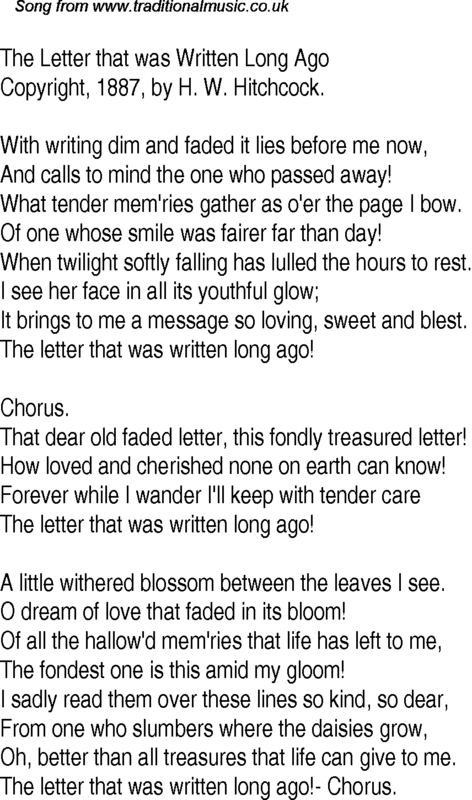 The letter that was written long ago!- Chorus.